Whether your new to market or a seasoned pro looking to find a office space in Manhattan our team can help make the process simple. Our commercial real estate brokers are available to help in your search regardless if you’re a startup or a pre-existing business we’ve serviced all industries including but not limited to; finance, fashion, media, tech, law, and more! Average Available Size: 3,000 SF. Square Footage: 2,000 SF. to 15,000 SF. Find a COMMERCIAL SPACE For Your Business Now! We will put together an office space tour report that details only the viable spaces available based on your preferred location, budget, image, time, and any other detailed criteria import to you and your operations. Estimated Time: Instant; in less than a Minute see all of the available spaces on the market today! 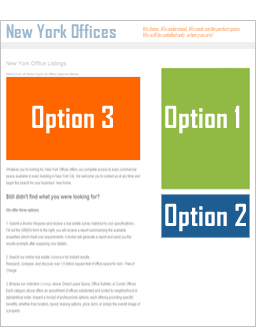 Option #3: Featured Real Estate Listings below offers a snapshot into the available commercial properties which either host other law firms / professionals - or are best suited for a legal practice. Estimated Time: Instant; browse through our Listings - each of which has been selected by our Brokers for their outstanding value, detail, and quality of service! For those who choose to rent office space directly from the landlord of the building, this means that there is a contract only between two parties, the landlord and tenant (business owner). This type of lease can be for a year or a period of five years or more - as commercial office space leases will vary. A commercial sublet naturally refers to any sublease agreement involving a commercial space. When individuals enter into a sublease in order to secure office space they are entering into a transaction with the current tenant of the office space. In the sublease agreement, the sublessee pays rent to the sublessor, who in turn pays rent to the landlord. Instead of renting a suite of offices, some companies purchase an individual unit in a complex. A condo unit is, essentially, an enclosed space owned and controlled exclusively by the unit owner. Marketing and sales flexibility may be the greatest advantage that condominiums offer a business owner. Each category above offers an assortment of offices subdivided and sorted. Inspect a myriad of professional options, each offering providing specific benefits; whether it be location, layout, leasing options, price, term, or simply the overall image of a property. Browse through our selection of offices and gain insight into the monthly esitmate costs towards for lease and rent. When your ready to see more we provide space photos, floor plans, building details, and any other data needed towards choosing the right office. From main street class A office space to side street rentals let us set up a tour report detailing only those listings which fall into your budget, image, and desired location. We typically cover a range of buildings from 86th Street all the way down to Battery Park. Office sublets abound but their availability isn’t publically available in most instances, moreover most primary commercial leasors don’t want to be innudated by poor or unqualified prospect tenants. Because of this many business have turned to us towards fulfulling their professional needs and filling in unused space. We can not only match you with a strong and sound primary tenant but one that either compliments or services your industry! If you require a larger space that provides all the bells and whistles from floor to ceiling we can match you with the proper space available on the market! Many of these rentals offer a substatial value and come with many benefits, from attractive and sought after architectural details to phones & furniture! Don’t see something small or flexible or affordable enough for you; we’ve established relationships with many of the biggest and best providers of coworking spaces, serviced offices, sublet office spaces, and executive suites found today! Send us your business requirements and our brokers will contact you promptly on this type of space requirement.